We've been hunting high and low for natural, cruelty-free and vegan deodorants that actually work. As it turns out, this is no such easy task. We had heard good things about both the Schmidt's and Meow Meow Tweet brands, so when Jannifer from The-V-SPOT reached out to us to let us try some, we were quite excited! Many deodorants contain a whole bunch of harmful ingredients, which it's much healthier to avoid. Putting these chemicals onto our pits means they're absorbed by our skin and into the body. Yuck, no thank you. These substances can disrupt the body's hormonal balance, and may be linked to health risks such as cancer, organ damage, allergic reactions and skin irritants. The good news is though that there are natural alternatives out there, which are much safer to use. 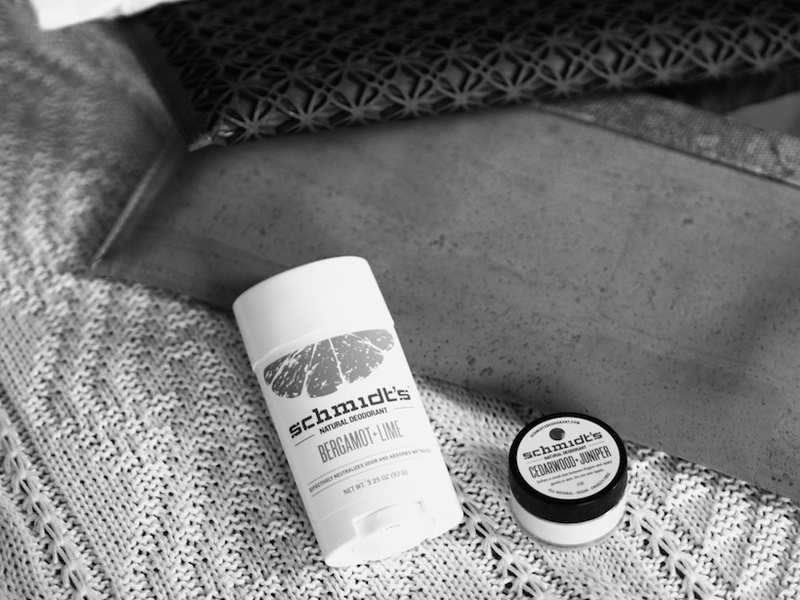 Schmidts was started in Portland in 2010 by Jamie Schmidt, who was determined to make natural deodorant that was actually effective. Initially Jamie just made the deodorant for herself and her family, but she soon began selling them at markets and cooperatives, and demand has been growing ever since. Schmidts is 100% free from aluminium, parabens, propylene-glycol, phthalates, gluten and artificial fragrance. It contains natural ingredients, and is PETA-approved vegan and Leaping Bunny certified cruelty-free. It is made in Portland, OR, USA. Meow Meow Tweet is a small-batch skin care company that creates vegan products with pure, all natural and organic ingredients. The founders Tara and Jeff are vegan themselves, and drew inspiration to launch MMT from their passion for the slow and local food movement. They have taken these ideals and applied them to their skincare products. We love this! MMT was initially founded in Brooklyn, but the pair have since relocated their brand to the Hudson Valley (where it is now made). Where to get your hands on them.. The recently launched The-V-SPOT stocks a wide range of entirely vegan products, from ethical fashion to eco beauty products. Here you can find both deodorant brands, in stick or cream form, and in a variety of different scents. Meow Meow Tweet COMES IN..
We really liked both brands. And importantly, they worked. Seriously, we've been through several natural deodorant brands in the past few years, and it has taken until now to find some that we're actually happy with. Others have needed reapplication several times a day, and really, who has the time for that?? Firstly though, we'd better mention that these are not like standard, run-of-the-mill, roll on deodorant. The cream is applied via an applicator or just a fingertip, and the sticks are not liquid, but more of a solid jelly. They took us some getting used to at first, but now we're proud converts to their natural ways. This was the first of the deodorants we tried. It seemed a little strange to apply it with our fingertips at first, but then we reasoned that moisturiser and lip balm are applied this way, so it's really not dissimilar. That being said, we didn't find this deodorant that convenient to use. It was rather waxy on our fingertips, and didn't seem to come off easily with water. It was also a little bit crumbly. Texture aside though, it really did work! There was no need to reapply it throughout the day, which is a huge accomplishment in the world of natural deodorants. With this success, we were happily looking forward to trying the other two deodorants. Butyrospermum parkii (shea butter), Sodium bicarbonate (baking soda), Maranta arundinacea (arrowroot) powder, Theobroma cacao (cocoa) seed butter, Cedrus deodara (Himalayan cedar) essential oil, Tocopherol (vitamin E), Juniperus (juniper) essential oil. SCHMIDT'S JAR VERDICT? 6/10 . It works, but we didn't like the texture much. 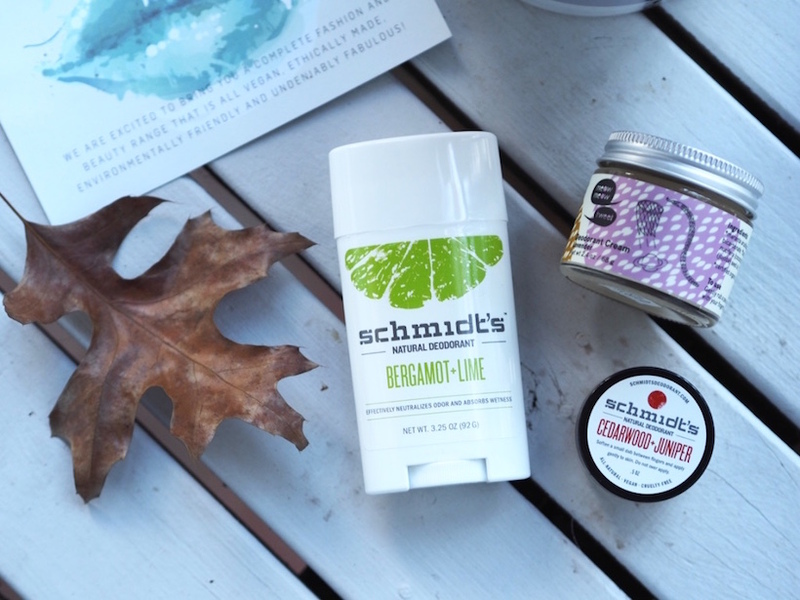 The next deodorant we trialled was the Schmidt's Bergamot + Lime stick version. We loved this product so much that we actually kept stealing it from each other's bathrooms - with hilarious accusations of "You stole my deodorant!" from both of us. The first application is a little crumbly, but (depending on the temperature of the skin/atmosphere) this quickly melts into the armpit and feels nicely 'dry'. The freshness lasted all day. As it's currently winter here in Melbourne, we were also keen to try this on our recent summer European holiday - to test how it performed in warmer weather. The verdict - it worked just as well - although one criticism is that as the product tends to crumble a little around the edge of the canister, it required cleaning before it could be popped into the cosmetic bag ready for the next day's travel. SCHMIDT'S STICK VERDICT? 8/10. It works, smells great, easy to apply, but a little crumbly on the edge of the canister. 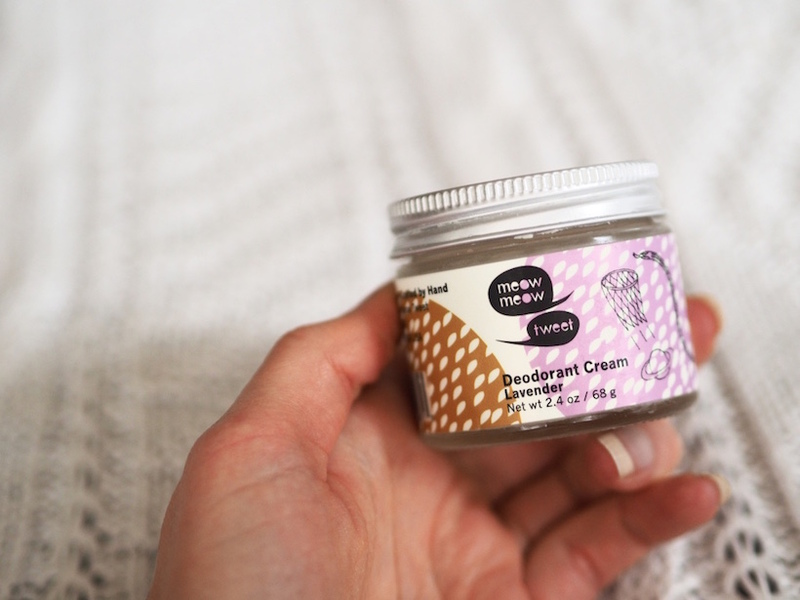 Having been so impressed with the Schmidt's stick, we weren't expecting to like the third product we tried, Meow Meow Tweet Deodorant Cream in Lavender, as much as we did. But it was a pleasant surprise. The cream is very easy to scoop from its jar, rubs into the pit very quickly, and importantly is simply wiped off fingers with a quick towel swipe. The deodorant feels like a moisturising cream, and yet provides a feeling of dryness at the same time. Even on long days filled with meetings, the product worked. The small jar worked well for travelling - and the product still worked admirably in the hot Portuguese and Spanish summer days and nights on our trip. MMT have also released a stick version, which we are eager to try. Because if that's an easier method of application, but works just as well as the cream version, it would be a pretty great product we reckon. *Maranta arudinacea (arrowroot) powder, sodium bicarbonate (baking soda), *cocos nucifera (virgin coconut) oil, *butyrospermum parkii (shea) butter, kaolin clay, *simmondsia chinensis (jojoba) oil, *lavandula officinalis (lavender) essential oil. MMT CREAM VERDICT? 8.5/10. It works, smells good, pretty easy to apply. Conscious Living :: What's on the Radar This Week? House Plants!